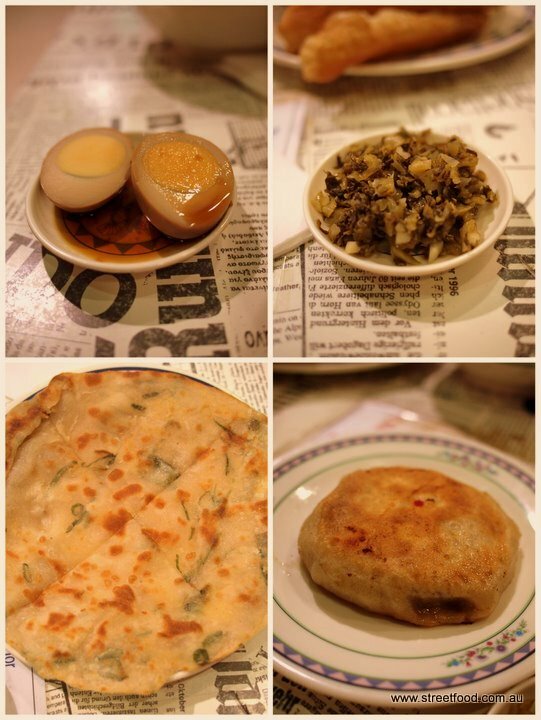 Carb-o-licious comfort food at Mother Chu's Taiwanese Gourmet in Chinatown. 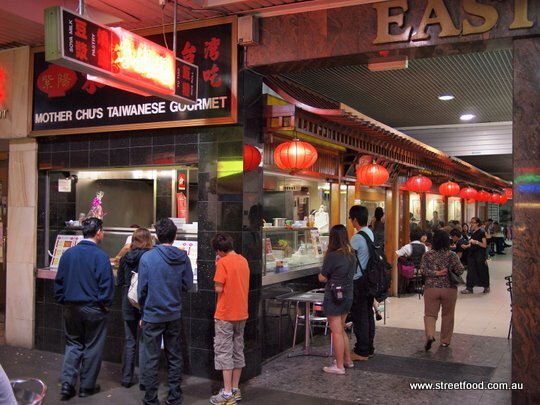 Mother Chu's is perched at the corner of a small arcade opening onto the Dixon Street mall in Chinatown. It's basic, cheap, and very popular. Tonight it's full but they set us up a table under the counter of the ice cream shop next door, under the watchful eye of Spongebob, sitting on the shop counter. There's free entertainment as tops ladies pound the dough day and night. 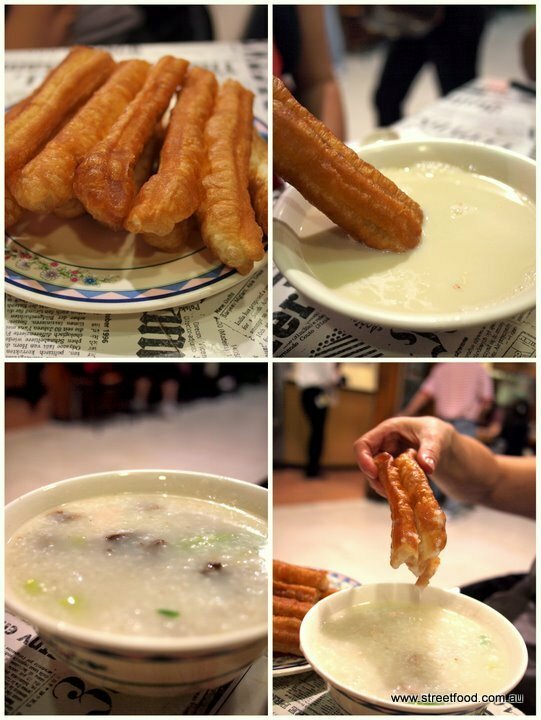 We order a bushel of fried bread sticks (YuTao - $2.20 for about three sticks) to dunk into anything that doesn't move: including a bowl of hot soy bean milk ($2.40); Taiwanese pork intestine congee ($7.50 - what is it with Alison and innards?) and chicken fillet congee ($7.50 - Jane's addiction). 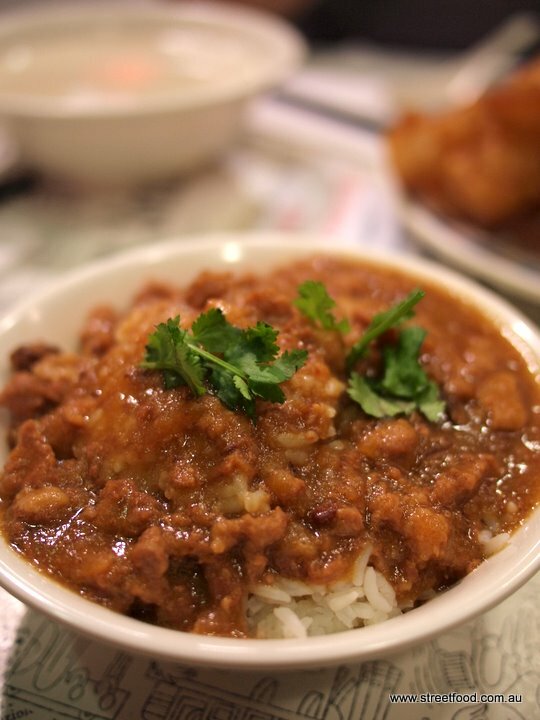 Ground pork sauce with rice - $5.50. Taiwanese mince meat on rice. What is it with Shawn and sloppy comfort food? The snackages are excellent value here - braised soy egg ($1.50 & eyebrow-raislingly delicious); special home made pickled (vegetables) - $1; pork pancake $2.80; and beef filled cake, $2.80. The food here is plain though cheap and filling, perhaps not everybody's cup of tea but it was just what were in the mood for tonight. Three of us were filled to the brim for only $40, and we probably could have ordered a dish or two less. We get a breakfast-time urge for congee so we waddle on down to Mother Chu's Taiwanese Gourmet in Chinatown. 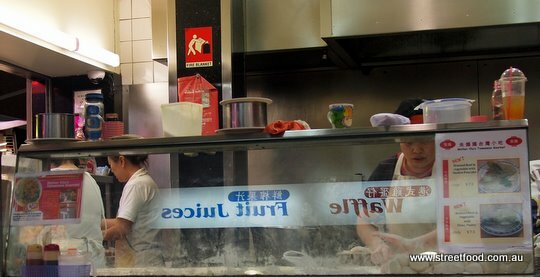 Mother Chu's in the Dixon Street Mall opens at 8.30am and does some classic Taiwanese dishes, it's busy even on a bleary eyed Sunday morning. Taiwanese style savoury mince congee - about $8. The classic dish of rice porridge flavoured with mince that kind of tastes like rissole, we've dubbed it 'rissole congee'. Yum. Pork and preserved egg congee - always a winner - around $8. Yu tiao - fried breadsticks, essential for congee dunking, around $2.20 x 2 serves. Breadsticks dunked into hot or cold soy milk (about $2.50) is a worthy breakfast on it's own. The soy milk is fairly sweet and the breadstick is fairly oily, it's a little naughty but so nice. Egg pancake - around $3. A plain savoury pancake with googie inside. Savoury soybean milk - around $4. This mystery punt turned out to be our favourite find: the beancurd is custard-like in texture, floating in clean soup stock, with hunks of fried bread with a big surprise hit of sweet vinegar. Google tells us this is quite a popular breakfast dish. Yum. We over-ordered bigtime and couldn't get through it all. Next time we'll just go the savoury soybean milk or breadsticks dunked in soy milk for less than a fiver. Brekky for less than five bucks. Lovely. We've just returned from three weekings eating in Taiwan and we're chuffed to find our favourite Taiwanese breakfast snack at Mother Chu's. 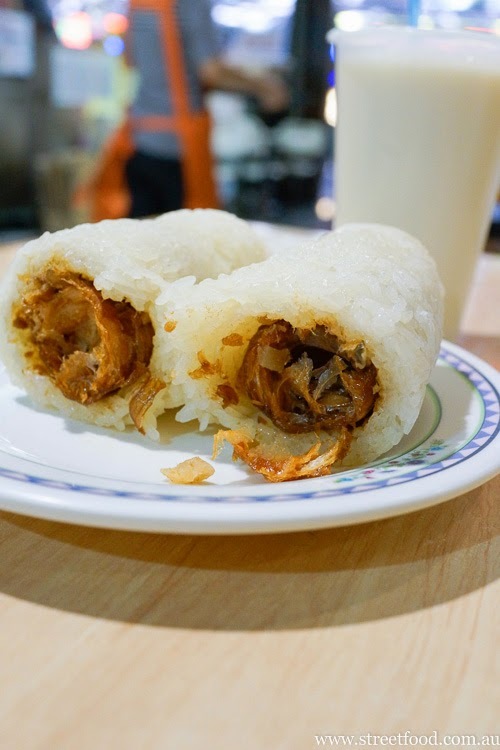 These are sticky rice rolls filled with crunchy fried bread, pickled veggies and meat floss. Only $4.50 each. The you tou and hot soy milk is a traditional Taiwanese breakfast. Mother Chu's does a good one and most mornings is filled with Taiwanese having their breakfast. Ah I didn't know it was a breakfast dish - I've had it as a pre-bedtime snack in Thailand and Laos. You tou and soy milk is pretty good comfort food nonetheless (no matter what the time)! But good to see you enjoyed lou rou fan (minced pork and rice) - along with beef noodles and stinky tofu it is one of Taiwan's national snacks. Stinky Tofu! I didn't see that on the menu, might have to go back and investigate, maybe at breakfast time. By the way, I work in Chinatown Sydney, thought I am not Asian. Really enjoyed it - food not amazing, but super value and just the thing for a wintry night. Still rate Superbowl as the best congee, but really enjoyed the preserved egg and pork congee we had, and thought the staff and service were great. Thanks guys! DEfinitely great value food. How can you argue with that? ?